Never mind the why and wherefore, the vote is in. A romantic vision has trumped pragmatism, and we all now need to make the best of it. Unhappily, so deep in commedia dell'arte was the campaign that nobody has the least idea of what such practicality entails. The journey from romance to pragmatic positions may be a long one. Things about which we can be relatively sure. Britain’s trade links may become subject to tariffs, but they themselves will remain as before. Exchange rate reductions may be needed to compensate for this. That said, the regulations which exports need to meet will remain precisely the same as they already were. This places strong limits of the “deregulation” which Brexit advocates saw as a key to economic revival. Many grand regulations – on, for example, the environment – are subject to international treaty and not specifically EU regulation. Those will continue to stand, or will need to be renegotiated. Much law of European origin will need to be abolished, adopted into specific UK law or simply allowed to stand. This will be a major burden on Parliamentary time unless consolidated into a portmanteau bill, which will surely give rise to regulatory crudities. First, there are the headline economic issues of tariffs and quotas; the regulatory matters concerning embodied pollution, child labour and such; and and the specifically technical matters around customs procedures. This last in non-trivial in a world of integrated supply chains. All of this has to be worked out on a partner-by-partner, industry-by-industry basis. Second, there need to be dispute resolution procedures. The investor-state dispute settlement (ISDS) mechanisms have been critical to past GATT rounds, to the WTO constitution and is now one of the most controversial elements of the TTIP and TTP trade deals. If a state abrogates a deal, changes regulations that had previously been agreed between the parties, then firms can take legal action against governments. Regulatory mercantalism within countries is often a stronger barrier to trade than what happens at the frontier. Lobbying by regional interest, by declining industries, by labour, by most NGOs all push politics towards the restriction of trade. These constants delineate a long journey from here to wherever “there” may be, a journey through an uncertain landscape. That uncertainty needs to be set against four very important variables. First, the EU is not itself a given, a static truth. Its core problem is the Euro, and one of two things will eventually come about as a result of this. Either a trans-national system for fiscal management is imposed on member countries, or else the Euro will fragment to a core of compliant economic peers, perhaps ringed by coterie of national currencies or national pseudo-Euros in a re-run of the 1990s ERM. The first of these requires huge sacrifice of sovereignty, followed by cost squeezes to bring the likes of Spain and Italy into productivity parity with Germany and Scandinavia. Given the $400 bn of bad loans in the Italian banking system, the precarious nature of Spanish politics and the inability of the French government to deliver even modest labour reforms, that is not going to happen. Thus, sooner or later, awareness will crystallize that the Euro has benefited only Germany – and perhaps a coterie of lesser peer economies – and that it has greatly harmed its other members. Hard on the heels of that – and of other crises in the region – markets will take a view. Either Germany will then leave “upward” or else the training wheel crowd will leave, “downwards”. Second, rich-world demographics are generally poor, and those of Europe are particularly bad. Little or no provision has been made to finance public pensions. The OECD estimates that pensions plus medical and other care in old age will swallow a fifth to a quarter of its member’s budgets in the years beyond 2025. And more, of course, in Italy, where at most a few percent of state pensions have been financed to date. Third, the low skilled amongst the rich world labour force have seen no increase in real wages for decades, and in many cases have suffered a fall. Many jobs have been automated, others sourced in low wage areas. Immigrants have arrived to take the jobs that remain. The nature and ethos of the low-income communities have been changed by this, a mixture that derives from the decline of labour-intensive industry and from ethnic dilution. People with complex skills have, by contrast, done very well. This is reflected by centres of affluence that have acquired inaccessible property values, and which enjoy public values that do not answer to national opinion. London has become more like New York than either of them are like their respective hinterlands. The groups that are left behind by all of this feel aliens in their own country, betrayed by elites, preyed upon by corporations. They are ripe for a populism that closes borders to immigration and rejects trade agreements, protects jobs, inhibits automation, opposes technology and generally takes all of the measures guaranteed to sink a country in today’s economic environment. France and Italy are amongst the more vulnerable to such issues in Europe, but even the US is not immune. Arguably, the Brexit vote stemmed in large measure from support by this group. Fourth, and ultimately the most significant of all, is the emergence of educated billions in the low income economies. These countries surpassed the economic output of the world rich world in 2014. They will probably generate 75% of output in 2035. They will have more graduates than the OECD has citizens, and their middle classes will be numbered in billions. Their political power, and the values which they espouse, will not be those of the liberal elite in the rich world. This will be a time of extremely rapid technological change, breakneck commercial change and unceasing competition. It is not an environment that will be supportive of elderly, querulous societies that want to put the clock back to the 1960s. It is against this background that Britain has to make its way. What lessons are there to be learned as to what we should do in the next few years? First, there cannot be too much analysis. We still do not know, in the words of Donald Rumsfeld, what we do not know. Before action must come a comprehensive assessment as to what our options are, what external events will impact upon or invalidate these, and how we should go about pursuing them. As a component of this, precisely what “trade deals” means in practice is something that needs a precise answer, industry by industry, trading block by national interest. We need to acquire a large number – hundreds - of negotiators, from whatever origin. Second, we should – somehow – set about defusing the grievances of the losers from globalisation. They have the potential to do the country immeasurable harm. Such action is most likely to come from the political left. However, the future of the British Labour party may consist of its forming once again as a national centre Left party, accepting Brexit but otherwise outflanking Ukip. Achieving this will take a decade. Equally, though, it may break into a small, entirely English, hard left which is minded to oppose Brexit. Such a structure will never achieve power or a meaningful voice in British politics. If nobody gives a voice to this group, however, it will find one for itself, probably through Ukip. Third, we need to distill what we want into a practical, clean set of negotiating positions. We should ditch the romantic in favour of the achievable, and agree on what we want to achieve. Fourth, we should enter into dialogue with those European countries which are most likely to remain buoyant after a break-up of the Euro. That is, we need to find common ground with Northern Europeans, as well or in preference to the gross EU membership. Fifth, we should delay taking action. Events in Europe will probably occur with or without Britain’s exit from it; and if we stay semi-detached, we can act and form partnerships in ways that we cannot if we have moved outside of it. A suicide can always jump tomorrow, but to go right now is irrevocable. Finally – and this may well be a bridge that is much too far in current circumstances – we need to think critically about who and what comprises this British “we”. Is the UK as a whole the right level of scale at which we should be having these thoughts? It is clear, after all, that large, complex societies are becoming hard to govern at a single level. It may be appropriate to think of a more layered, subsidiary style of governance, one under which regions are able to specialise and to some extent go their own way. One could think of it as a national Commonwealth. This would be a Commonwealth of loosely coupled layers. At the “top” level, of course, every nation state enters into a plethora of transnational agreements, from science to economics, environment to security, migration to trade, regulatory standards to the protection of IP. They do this to gain advantages, but in doing so they also agree to lose sovereignty. You cannot be a completely sovereign modern nation. A layer down, history has asserted the primacy of national government over the composite regions. Even nations recently forged from principalities, or consciously decentralized to avoid political centralization, nonetheless possess architectures of power that assume that national government is supreme over regional politics. The nation state is, though, a largely arbitrary geographical construct that has been dumped onto the present by accidents of history. It is not homogeneous or somehow possessed of a mystical unity. Sub-national regions – for example, states within federations, major cities, even economic clusters – have their individual strengths and needs. If they are permitted to do so, they change their local governance to reflect this. Regional autonomy and small states seem better suited to complex times. Plainly, it is easier to manage a focused, smaller unit than it is a large and complex one, particularly if there are higher level structures that are running things at their own level of competence. Thus the national level should run defence, for example, whilst local centres of excellence ignore that and focus on their particular advantages. Aberdeen, for example, might focus on offshore engineering and the training, schools, facilities and regulation needed to make that industry world class. London has needs that rural England does not. The West Country is particularly suitable for retirement, tourism and similar economic activities that call for transport, hospitals and other facilities that are quite distinct from other regions. It has always been taken as read that the degree to which these regions couple into more-than-national agreements has to be through a homogeneous national interface. It is time that this assumption was challenged. London may need agreements with its European peers which Devon simply does not, and activities that are based in these two could answer to separate agreements. If Scotland that wanted close ties with "social" Europe, then there is no reason why it should not enter into these. This is an attractive model for the future: a Commonwealth of specialised entities, working together as 'Britain' for some outcomes, alone for their particular advantage in others. The flexibility would be reinforced by national structures that managed conflicts and acted to arbitrate amongst the interests. The figure places two important set of variables against one another. Vertically, it asks whether the EU retains its coherence over the next ten years; or whether instead it is forced into a major re-alignment. Horizontally, it asks whether Britain is able to formulate a clear and achievable set of expectations (of the EU and beyond it) or whether it retains a romantic and incoherent slant to what it seeks. Sweet Regrets: a state in which neither Europe nor Britain really has what it wants, but nonetheless the compromised is good enough, particularly given the increasingly terrifying external world. Britain keeps its focus, Europe becomes somewhat more worldly, and is more inclined to compromise with its federalist ideals. In parallel, it also acquires the institutional structures needed to manage and police its currency. This is the least bad outcome, in all likelihood. Northern Europe: the original European union fractures under the pressures which were described earlier, and Britain is able to play a role in the formation of a Northern economic peer group. The now much harder Euro is confined to Germany and its immediate neighbours. A quite separate structure, of which Britain plays no part, deals with the future of the Southern European states. It is not a body that inspires much confidence. Hang Separately: “If you don’t hang together, then you will hang separately.” The European project retains some symbolic properties, but its importance and weight is eroded by external events, by its internal political divisions and by a marked preference for the symbolic over the pragmatic. 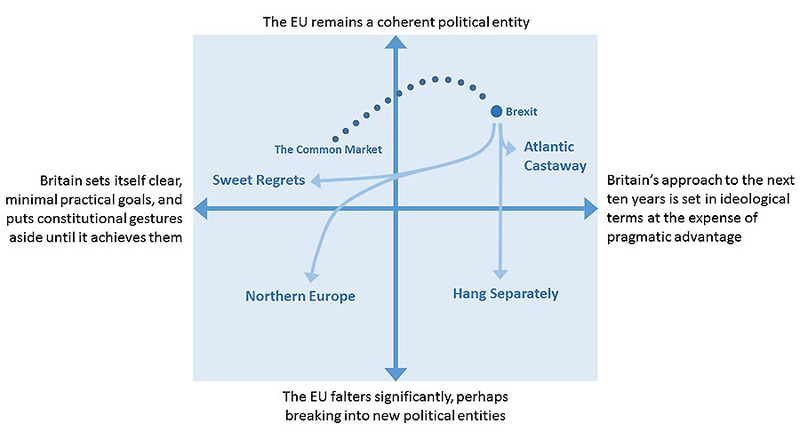 Atlantic Castaway: Europe prospers, Britain fails to find a meaningful role either as a non-aligned next door neighbour nor as a global citizen. Project Fear was right after all. These scenarios are, of course, extremely general. However, the key variables do seem to come down to this: that Britain knows what it wants, or it does not; and that Europe is or is not able to find a coherent balance around its public finances, the Euro and its role as something more than a customs union.